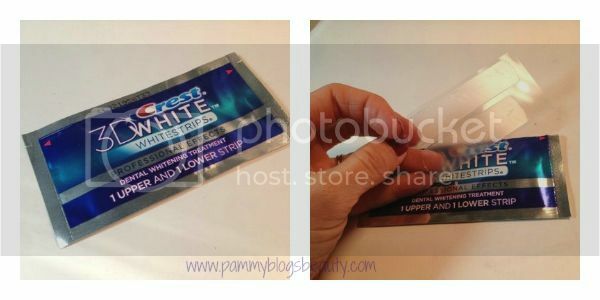 Pammy Blogs Beauty: An Easy Way to Brighten Your Smile: New Crest 3D Whitestrips! An Easy Way to Brighten Your Smile: New Crest 3D Whitestrips! There is no question, your smile is absolutely your best accessory! So, perk up those pearly whites!!! I usually whiten my teeth a few times a year. Despite my coffee drinking, my teeth generally stay remarkably white. I credit my Sonicare toothbrush and whitening toothpaste for my white smile. However, I still like to "boost" the whiteness annually with a whitening kit or my custom made (from my dentist) whitening trays. Honestly, I had not tried Crest's Whitestrips in years. I must say, they have really improved them since the last time I used them! I am very impressed with how quick and easy they are to use. To find out how I use my Crest 3D Whitestrips and to see some results, please keep reading! These are so easy to use! They come packaged in small foil pouches. Each pouch contains an upper and lower strip. The strips are like whitening "stickers" for your teeth. You just peel off each sticker and apply it to your clean teeth. The sticker wraps around the top of the teeth. The biggest improvement that I have notices since using Whitestrips many years ago is that these stickers really "stick"! They stay on very well until you take them off. The nice thing about Whitestrips is that you can customize your results! Just keep using them until you get to your desired level of whiteness. I find that I really only need to use them about 5 times to get the boost of whitening that I desire. However, if your teeth are more stained, you might need to use them longer. For me? Pain Free! And Affordable too! Unlike my perscription whitening trays from the Dentist, the Whitestrips do not cause tooth sensitivity with me. This is a HUGE plus! Honestly, these Whitestrips are so easy to use and so pain free that I might never use my Dentist whitening trays and gel again. Plus, the Whitestrips are so much more affordable! They retail for about $35.00 at the drugstore. It literally only takes a few minutes to use these! I apply right before bed after I brush my teeth. I wear them as I finish up my night time routine and remove them before climbing into bed. The only downside to these Whitestrips (and all of the other types of tooth whitening that I have done in the past) is that they do dry out your mouth. Granted, I seem to have more issues with dry mouth anyways. So, this might not bother everyone. Oh well! Dry mouth for a few days is just the price that I have to pay to get my teeth extra white. It is a sacrifice that I am willing to make for sure! 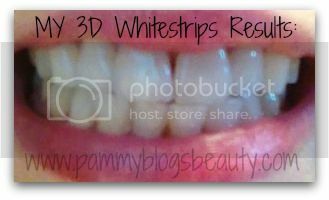 All-in-all, I am really pleased with my results from Crest's 3D Whitestrips kit! What do you use for tooth whitening? 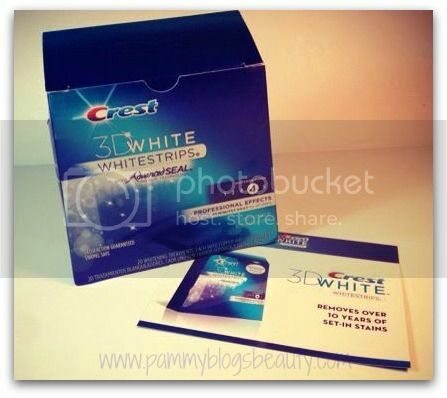 Have you tried these Crest 3D Whitestrips? I may have to try this. My teeth haven't been as white as they were before I got my braces removed. I like how this product doesn't cause tooth sensitivity (one of my major concerns as I love my cold drinks!) and is affordable.